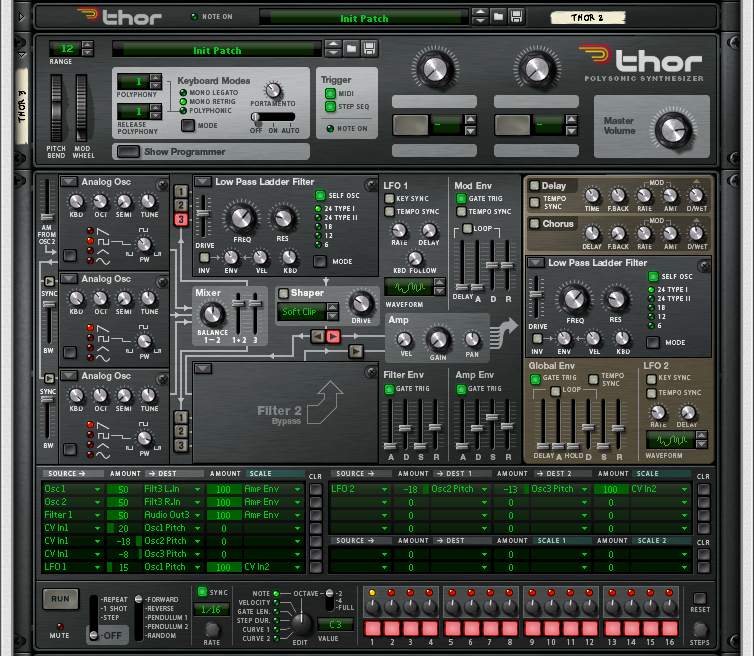 Thor is a flexible synthesizer with three oscillators so it already has a big sound. 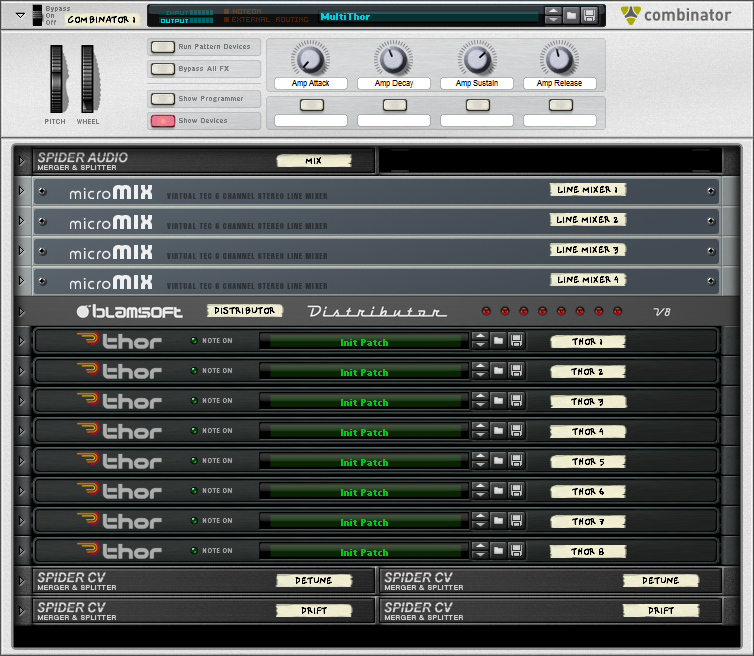 In this tutorial we present a Combinator that can make Thor sound warmer, like an analog synthesizer. The Combinator can be tweaked for all sorts of other possibilities as well. It may be useful to see the routing and mappings used to make a multi-voice synth so you can more easily make your own, and also see Blamsoft’s favorite Thor tricks. 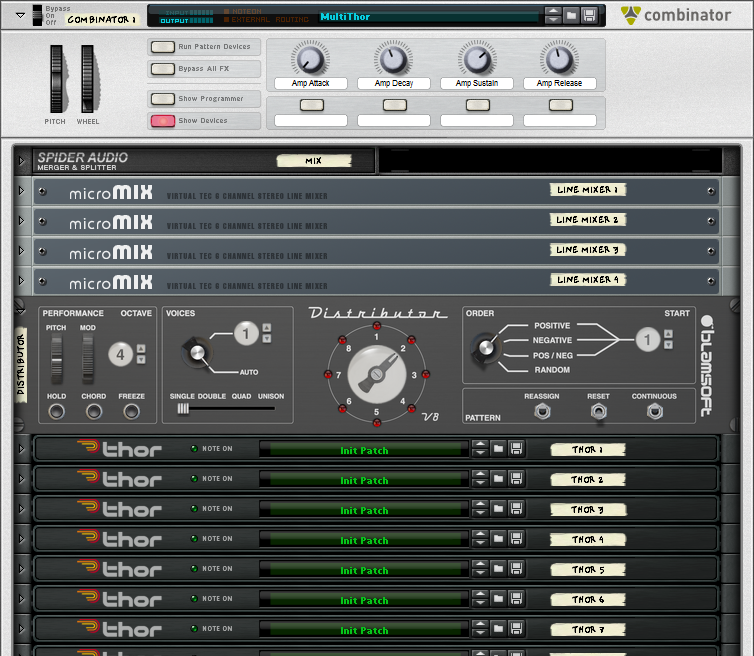 The Combinator consists of four line mixers to mix the oscillators, a Distributor to handle the MIDI and distribute the notes, eight Thors as voices, and some Spider devices for routing help. The Combinator rotary knobs universally control the Amp envelope of all of the Thors. A big synth like the Oberheim Matrix 12 allows each voice to be separately panned. In this setup it’s taken a step further and each oscillator has it’s own channel in the mixer. 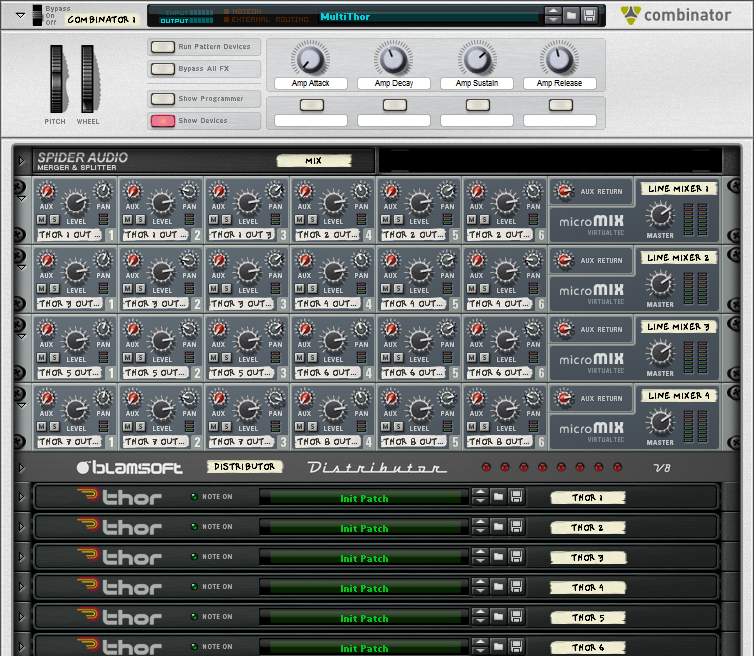 Each synth takes up three channels so each line mixer has two Thors. Oscillator 1, 2, and 3 take up the first, second, and third channels respectively. 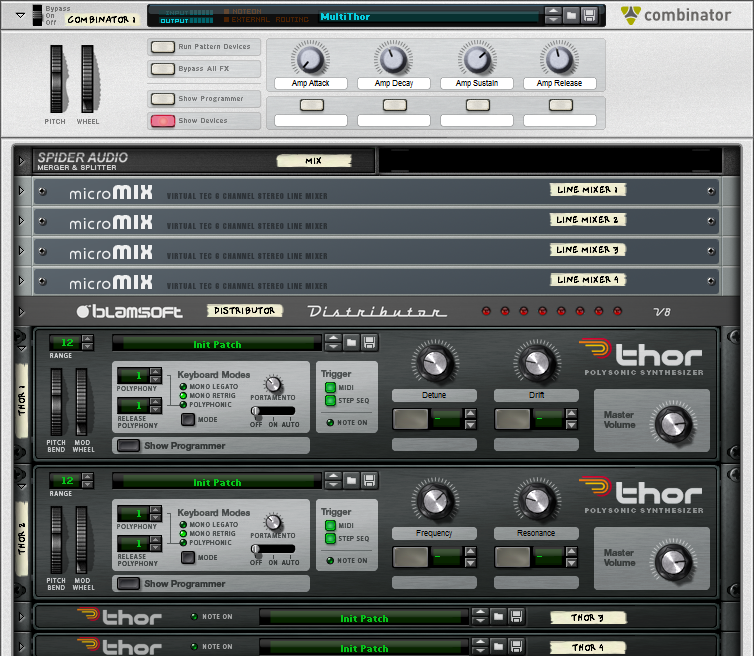 And again, the fourth, fifth, and sixth channels for the second Thor. The Distributor is controlling all of the Thors over CV, including gate, note, pitch wheel, and mod wheel. The first two Thors have universal controls, Detune, Drift, Frequency, and Resonance. Detune adjusts the tuning of each oscillator slightly differently. Drift controls the amount of slow random variation in the oscillator tuning. Frequency adjusts the filter frequency for all of the filters and resonance adjusts the resonance. There are a few subtle tricks going on in the Thor patch. First is getting true stereo output for oscillators 1 and 2. The most important part is that the Amp gain knob is turned all the way down. The oscillators are routed directly to filter 3 and the amp envelope is applied with scaling. Any time you’re trying to control oscillator panning in Thor the Amp gain knob must be down and the envelope applied in the programming matrix! To get oscillator 3 on it’s own output channel it is routed through filter 1 and then to output 3. So oscillators 1 and 2 go through filter 3 in true stereo, and oscillator 3 goes through filter 1. Note that the filter 1 envelope is the filter envelope but the filter 3 envelope is the global envelope. If you didn’t need to have oscillator 3 on a separate channel you could route it to filter 3 using the programming matrix. The other programmer settings have to do with Detune and Drift. Detune applies a constant offset to the oscillator pitch from CV In 1, which is the Detune knob from Thor 1. Drift is done with the LFOs set to a slow smooth random waveform. You could use just one LFO for drift if you needed the other. The Drift waveform is scaled by CV In 2, which is the Drift knob from Thor 1. A little variation is added by using different PWM settings for oscillator 1 and not exactly matching the filter envelopes. Now that you know what’s in the Combinator you can adjust it to your tastes. Leave comments and suggestions below.